Hi love muffins! So excited for our boho Cali fresh guest today. 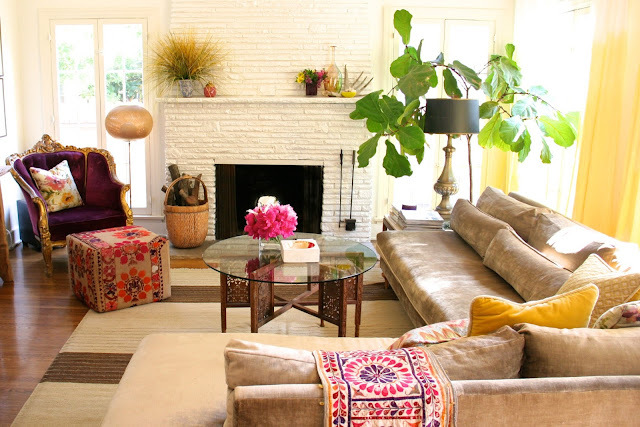 Sometimes a girl just needs a California girl, Kim Salmela Interiors, to rock a a boho chic space like it is her job. And well, it is her job. I am immediately attracted to Kim's designs because of the unique juxtaposition of elements and the insane pops of color. Since I have been drawn to all white spaces with colorful accessories as of lately, imagine my surprise and excitement when I laid eyes on Kim's space. Just you wait for this boho chic space. Hi S+S readers I am Kim from Kim Salmela Interiors! I am thrilled to be sharing my favorite space with you all today, my living room. It is one of my favorite rooms because of the history, memories and mood that this room creates. When people walk into my house, this is the first room that they enter and they always comment on how fresh it feels. During the day, the sun shines through the white linen curtains that I hand dyed an ombre yellow to give them more design. It is impossible to be in a bad mood in this room! 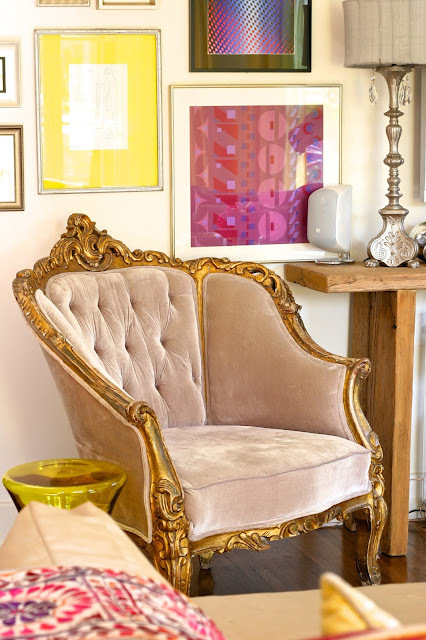 I have owned the gold leaf, purple velvet chair for almost 15 years. It is a bit gawdy if I have to be honest, but the carving plays well off the modern light fixture. I had fallen in love with the silk velvet years ago, and just decided to go for it. I think this chair is the perfect example of how people should make decisions when designing.....if you love something, it can't be a mistake! This chair has gone with me from Minneapolis to LA and has seen many different settings. I recently considered reupholstering it and using it in another room, and it will be a sad day when I do pull that trigger. Wasn't that fresh, lovely and collected? And in case you didn't get enough of Kim's work, head over here to see even more of her goods! Wow! 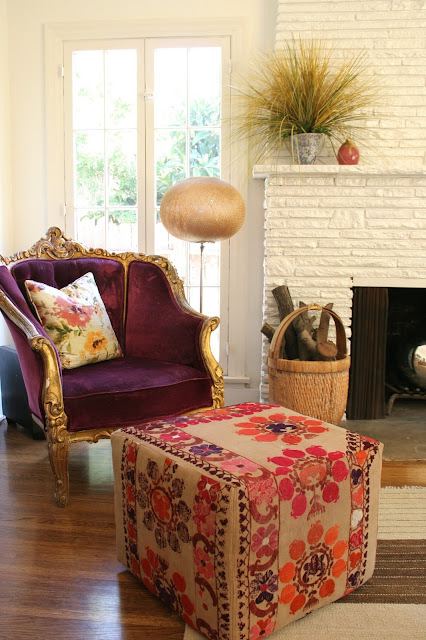 That rug made into ottoman is amazing. Love all the vintage chairs and textiles. Beautiful space! loved the chairs!! They add so much personality! Thanks for the fa this fabulous introduction! Hey! I recognize that headboard fabric...! Thanks for this great introduction to a new (to me) designer. I'm off to check out more of her spaces. Beautiful! Love that her style is so unique. Love it all! Have you come across a good resource for fiddle leaf fig trees in the KC area? I haven't had any luck and I need to get my hands on one. That living room is gorgeous! So fresh and clean. LOVE her style! 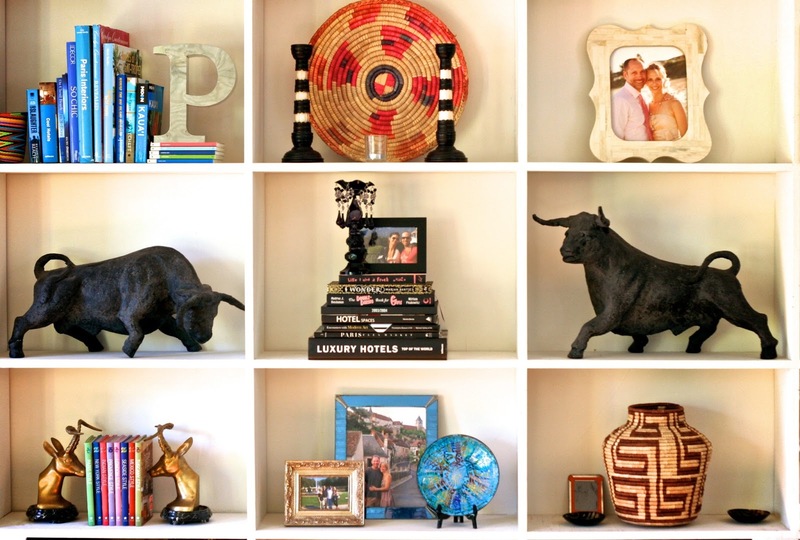 So many treats for the eyes but my favorite is the bull statues on the bookcases! love the mix of styles - the modern with the vintage. What a truly cool Cali space! I could see myself reclining in that chair, drinking champagne like a queen! Awesomeness all around! I am loving all of the glamorous aspects of this space. A gem! Beautiful! I love this room! that headboard in the bedroom is heaven - the girly pattern mixes well with the masculine space!